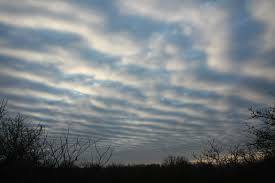 The mackerel scales and mare’s tails are, respectively, cumulus clouds and cirrus clouds. Regardless of nomenclature, these cloud banks preclude unstable weather, the approach of a front bearing rain or snow within the next twenty-four hours. But meteorological information can’t begin to describe what you’ll see if you look to the sky for a hint of what tomorrow might bring. Working outdoors the other day, I was fortunate to watch a phalanx of stratocumulous clouds advancing along the mountain ridges to the east. The cloud ranks were still well-spaced so enough light seeped through to color the horizon soft, salmony pink to red. White-gray clouds nearest me, still floated mostly independent; those following shaded darker, more ominous, blending into dark mass. On such a morning, a man might step up for chores, wonder at the fluid colors and perhaps understand more clearly the old saw about red sky and morning. And if he’s winter wishing on a snappy but drab December day, he can’t help but hope the changing weather might bring a little snow to relieve the boredom of the brown-gray days. But by afternoon the wind’s swung to the south, it’s forty degrees, and a cold rain spatters onto the muddy ground. There’ll be no white dazzle when he wakes up tomorrow morning. He’ll have only his sunrise memory to get him hoping again.